Research indicates that cutting back on carbohydrates is an efficient way to lose weight and improve your health. High-carb foods, like wheat flour and sugar, promote binge eating, stimulate your appetite, and increase caloric intake. The problem is that this is easier said than done for most people. 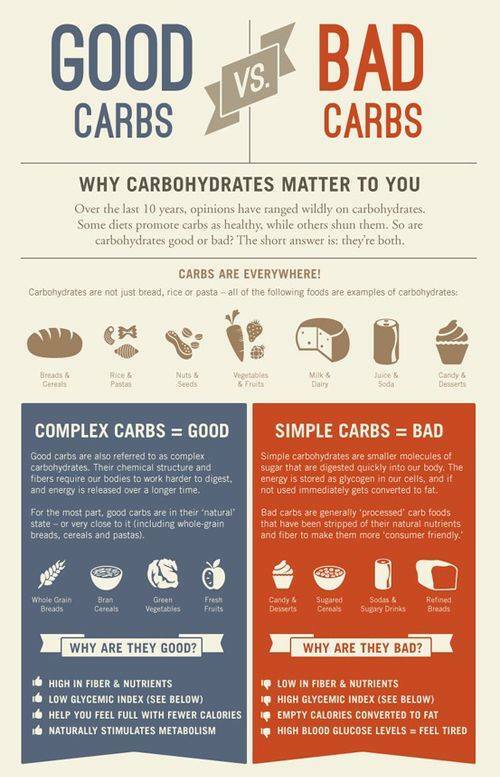 Refined carbohydrates tend to make up the bulk of what an average person eats. Bread, pasta, crackers, cookies, cakes, and pretzels are just several examples of foods that contain wheat flour and/or sugar. Plus, all of the so called "healthy foods" we buy pre-made in the store have list of ingredients that we don't even know what they mean. Since food labels tend to mislead us into thinking they're are healthy, it is best to avoid packaged and pre-cooked foods all together and replace them with REAL, WHOLE, FOODS like fresh fruits, vegetables, lean meats, nuts and seeds. If you must eat processed foods, then only buy packaged foods if you understand what is on the label. Lastly, do your best to avoid labels that say "fat free" or "low fat" foods unless they are truly fat free or low fat whole foods listed above. This is because fat free foods have contributed significantly to the problems of obesity and metabolic disease. Carbohydrates are converted to glucose (sugar) when digested. Wheat and sugar contain highly digestible carbohydrates that quickly enter the bloodstream and cause a spike in blood sugar levels. When this happens, your body sends insulin to bring those levels down. When elevated blood sugar is lowered, low blood sugar levels become the uncomfortable result. Low blood sugar is dangerous, so your appetite increases in order to bring it up to normal as soon as possible. You crave foods that quickly elevate your blood sugar, starting the cycle all over again. Taking out refined carbohydrates decreases caloric intake. Studies have shown that those who remove these foods from their diets consume an average of about 400 calories fewer than those who maintain a high carbohydrate diet. Wheat's polypeptides pass through the blood brain barrier, reaching opiate receptors in the brain and producing feelings of euphoria. Wheat becomes an addictive substance that can cause symptoms of withdrawal when cut from the diet. Eating sugar leads to similar results. It releases opioids and dopamine, which are also activated by addictive drugs. This leads to craving and bingeing. 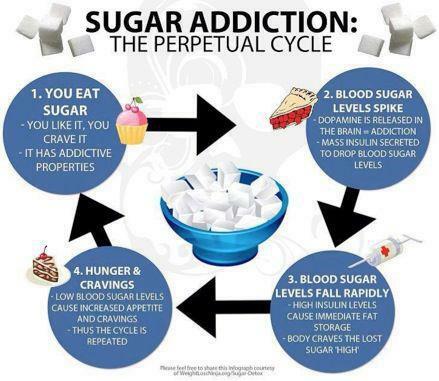 A person who regularly consumes sugar will also experience withdrawal effects. Several studies that have compared low-fat diets with low carbohydrate diets show that cutting carbs is more effective in promoting significant weight loss. In addition to taking off weight, low-carb diets improve other health markers, including lower insulin sensitivity and triglyceride levels in people who are obese. Cutting out refined carbohydrates like wheat and sugar has proven to be a healthy and effective way to lose weight. A diet that is lower in carbohydrates tends to be lower in calories. When you remove high carbohydrate, addictive foods that stimulate your appetite and replace them with nutritious, satisfying foods, you can lose weight naturally without hunger. Join Our Weight Loss Group For Low Carb Recipes, Tips & Support! Eating low carb (or even lower carb) does not have to be so hard or feel so depriving. 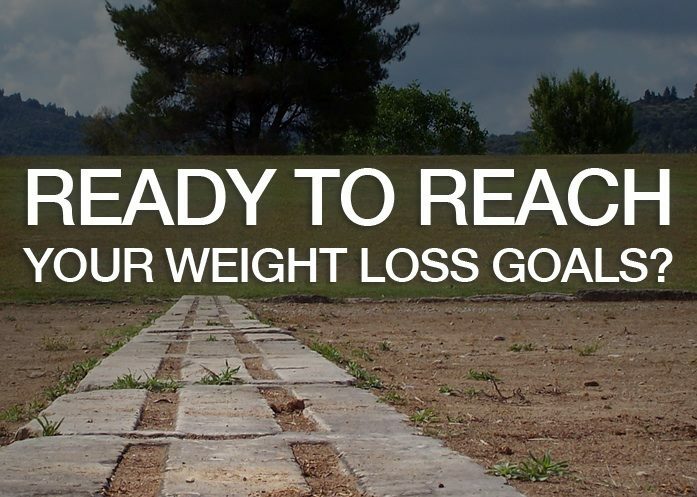 It just takes understanding how to make the best low carb food choices, planning how to make this a lifestyle change instead of another failed fad diet and getting the low carb recipes, support and tips you need to make this a realistic weight loss and life long change for you. JOIN OUR GROUP to learn more! Don't forget to order your Skinny Fiber or Skinny Body Max, so that you can start your 90 Day Weight Loss Challenge with us next month. It just takes a few days to get to you in the USA. Yancy, W. "A Low-carbohydrate, Ketogenic Diet versus a Low-fat Diet to Treat Obesity and Hyperlipidemia*1." ACC Current Journal Review 13.8 (2004): 18-19. Print. Bessesen, D. "Effect of a Low-Carbohydrate Diet on Appetite, Blood Glucose Levels, and Insulin Resistance in Obese Patients With Type 2 Diabetes." Yearbook of Endocrinology 2006 (2006): 149-51. Print. Samaha, Frederick F., and Et Al. "A Low-Carbohydrate as Compared with a Low-Fat Diet in Severe Obesity." The New England Journal of Medicine (2003): 2074-081. Print. Avena, Nicole M., Pedro Rada, and Bartley G. Hoebel. "Evidence for Sugar Addiction: Behavioral and Neurochemical Effects of Intermittent, Excessive Sugar Intake." Neuroscience & Biobehavioral Reviews 32.1 (2008): 20-39. Print. Colantuoni, C., J. Schwenker, J. McCarthy, P. Rada, B. Ladenheim, J.-L. Cadet, G. J. Schwartz, T. H. Moran, and B. G. Hoebel. "Excessive Sugar Intake Alters Binding to Dopamine and Mu-opioid Receptors in the Brain." Neuroreport 12.16 (2001): 3549-552. Print.